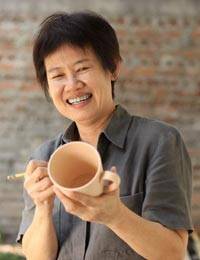 Taking her inspiration from Thailand's rich floral beauty, Duangkamol crafts two beautiful coffee mugs. Golden orchids blossom against a cool blue-green background in a superb example of the celadon ceramic art. The flowers appear in the natural color of the clay, and depict the yellow dendrobium orchids collected in April.